This is my husbands favourite stir fry. For years I was trying to get it right, and make one he would like, then I came across this recipe in a Julie Goodwin cookbook and he loved it. My kids love it also, so much so, they always hope there are leftovers so they can take it for school lunch the next day. 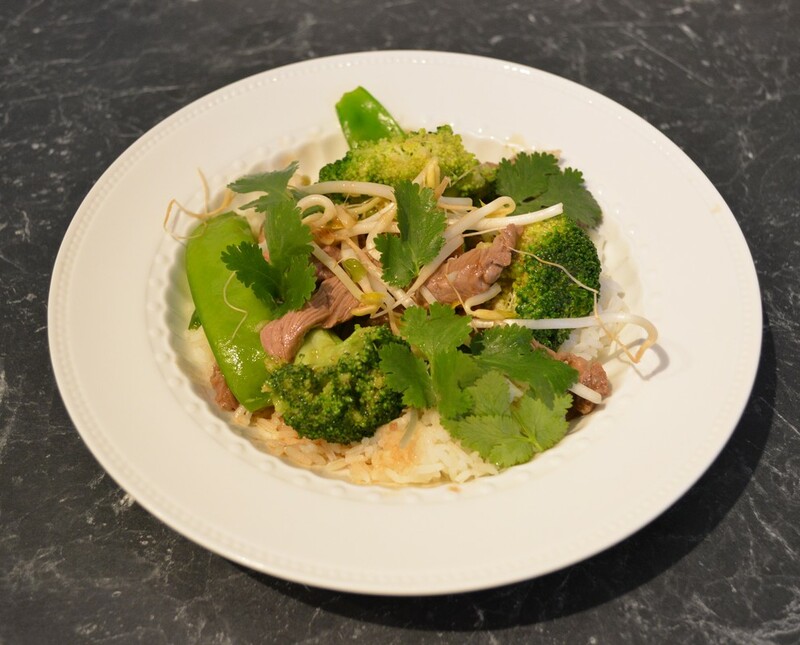 My family like a really saucy stir fry, so the rice or noodles get all that extra flavour, so I don't remove the water after I cook the broccoli, Julie does, so if you want a drier stir fry remove the water if you want it saucier keep it. My biggest tip, chop and get everything ready before you start, so that the cooking flows once you start putting things in the wok. Combine the light soy sauce, sugar, cornflour and water in a medium bowl, whisk well to combine. Add the thinly sliced rump steak, mix well to ensure all of it is well coated, cover and refrigerate for 1 hour. I love a rice cooker as it ensures perfect rice every time. Once cooked it keeps it warm until needed. I turn it on now, so by the time the stir fry is cooked, my rice is ready. In a small bowl mix together the oyster sauce, light and dark soy sauce and 2 tablespoons water. Set aside. Heat a wok over high heat, working in batches, add 1 tablespoon oil, and a small amount of the beef-you will need to do this in 6-8 batches. Stir fry until browned and nearly cooked through, remove the meat from wok and place in a clean bowl. Repeat until all the meat is cooked. You may need to wipe the wok with a paper towel every now and then to remove any build up of marinade in the wok base. Wipe the wok clean. Add 1 tablespoon of oil, add the shallots, stir fry for a minute, until just starting to soften. Set aside with the meat. Add another 2 tablespoons oil to the hot wok. Add the broccoli, garlic, sugar and salt, stir fry for 30 seconds, then add 1/2 cup water. Put a lid on the wok, simmer for 3 minutes, or until the broccoli is cooked but still crisp. Now Julie would remove it from the wok and drain. I don't as I like it saucier. In a small bowl place the extra cornflour and 2 tablespoons water, whisk well to remove lumps. 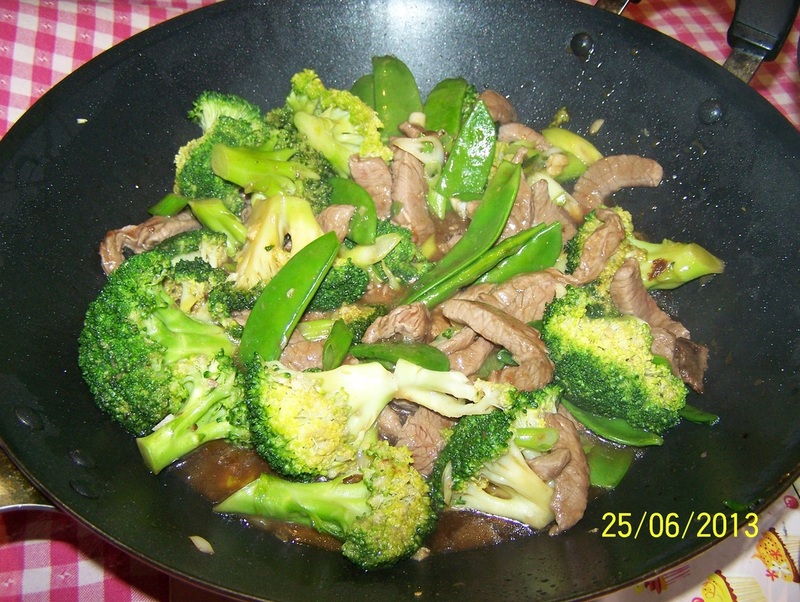 Add to the broccoli the beef, shallots, snow peas, oyster sauce mix and cornflour mix. Allow the mixture to boil and thicken slightly. If you like a little spice, add some chilli sauce now, I generally don't. Mix well, serve immediately over rice or noodles.